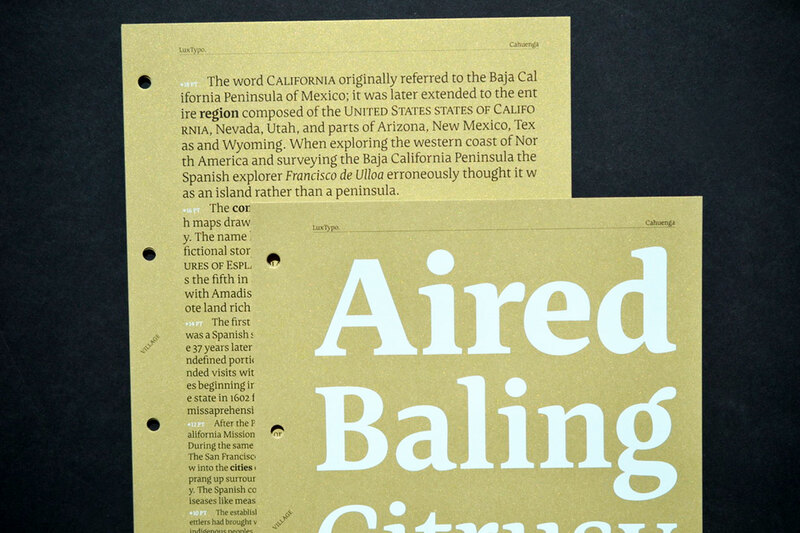 Cahuenga embodies clarity in text and distinction in display. Throughout the development process, references were sought out only as moments for consideration presented themselves. Thus, the development was long and complex with Cahuenga not prescribing to a single distinctive model as a foundation. Exploration around formal traits were influenced as much by aesthetics as they were by desired functional outcomes. Cahuenga organically holds a tone and pitch that is sincere. The name is emblematic of many who make their way via car through the Hollywood area of Los Angeles. As in many parts, the driving route is convoluted to get from point A to point B. However, it seems more often than not, that when in the Hollywood area, one usually ends up on Cahuenga Boulevard at some point. Cahuenga is a post post-modern, rational, non-calligraphic, personable serif in five roman & italic weights with built-in small capitals.